As we are at sea quite often with Dolphin Wild Eco Cruises, we apologize if we miss your phone call. Please contact us by email. Please check our Facebook Page for our next dive dates. Two-dive day trips to our Moreton Island Marine Park (including Flinders Reef) are scheduled for Sundays ONLY. To book, please email your completed Trip Booking Form (pdf) to secure your place. 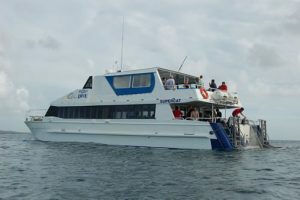 Our 22 metre dive vessel, SUPERCAT, was voted by our divers as Brisbane's "BEST" dive vessel. 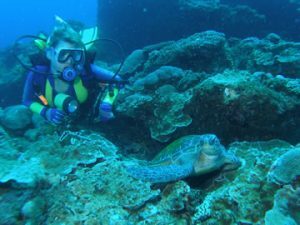 See Coral Reefs, Whales, Grey Nurse Sharks, Wrecks and our resident turtles at Flinders Reef. SUPERCAT is fast, air conditioned, has huge lounge seats to relax on, a licensed bar and kiosk, fresh buffet lunch, hire gear and compressors on board. Sidemount/Twins/Rebreathers are welcome on recreational dive days, but you must dive to our recreational limits. Rebreathers must have a Certification Card for the unit they are diving with. Please tell us your gear configuration at time of booking. There are no DIN tanks available onboard. If you own DIN regs, you will have to supply either DIN tanks or a DIN adaptor for use with our yoke tanks. We require you to bring the DIN insert for your valve to allow us to fill your tank for the second dive. If unsure please email us to confirm. 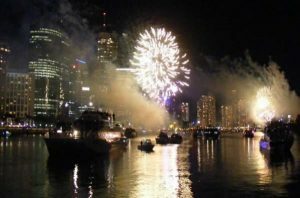 Join us on SUPERCAT for Brisbane's night of fireworks and entertainment cruising the Brisbane River. SUPERCAT is positioned every year in one of the best central places to view the fireworks. You may load at Newport Marina, Newport to cruise across the bay and up the Brisbane River (at no extra charge) or Mobray Park, East Brisbane. Don't delay, book now and cruise with Supercat Charters up the Brisbane River to find the perfect position for the fantastic display and amazing sights that light up the sky. For your next group event, spend a day on the bay with Supercat Charters! Whatever your needs we can tailor make a day to cater to your requirements. We guarantee that our destination and crew will make it a day to remember. We invite you and your group to celebrate your next event cruising Moreton Bay and Island. We specialize in providing chartered tours and offer the ultimate all inclusive day tour. See Facebook for our next dive dates.